For the next two weeks, Inside Out will feature stories about the Smart City of Calgary, which deployed one of the first City-owned LoRaWAN™-based networks in North America. 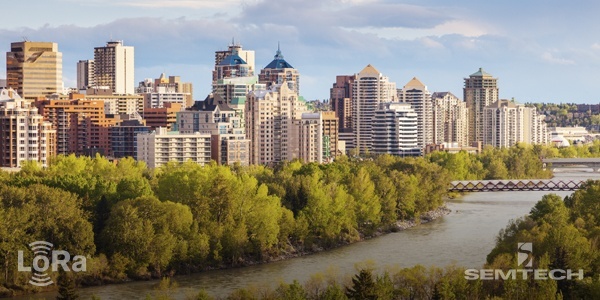 We kick off the series below with a guest blog from The City of Calgary below. Learn more about the Smart City of Calgary and stay tuned to Semtech’s blog throughout December for more stories about #SmartCalgary. Calgary is at a pivotal moment in its history. Our city is faced with challenges. Since our city has limited resources, The City of Calgary’s focus is to lead the changes by providing critical infrastructure as a foundation to foster innovation with internal City business units, civic partners, educational institutions, and industry. The smart city approach is helping our city become more sustainable by bringing openness to data sharing and technology, as well as building trust and transparency with our municipal government and citizens. Over the past 20 years, we have steadily been building up our municipal communication infrastructure. When we discovered Semtech’s LoRa® devices and wireless radio frequency technology (LoRa Technology), we were able to deploy one of the first City-owned LoRaWAN-based networks in North America with minimal additional cost. The LoRaWAN standard is one of the leading open standards for low power wide area network technology. Cost effective deployments for trials, on our City-owned fiber and radio towers, can build and expand our LoRaWAN-based network with minimal addition cost. LoRa Technology’s inherent qualities enable resilient and reliable radio capabilities in urban environment. Battery operated sensors remove the requirement for fixed power and enable multiple years of battery life depending on the use case. This is quite useful to many of our use cases such as trailers, golf carts, etc. LoRa-based sensors and networks can fit easily into many software ecosystems. The LoRaWAN standard has security fundamentally built into the specification. Following a Request for Proposal procurement process, we worked with Calgary’s leading LoRaWAN-based radio equipment manufacturer, TEKTELIC Communications, who provided the network equipment using our existing radio towers and support around using LoRaWAN. Through our collaboration with TEKTELIC, we gained a better understanding of the technology, industry trends and of the technical risks evaluation process for future production use. This fundamental understanding gave The City of Calgary confidence in how to proceed using LoRaWAN-based technology for some of the future use cases. There is a lot of enthusiasm and excitement for prospective use cases at The City of Calgary. LoRaWAN is a great catalyst to start the Internet and Industrial Internet of Things services, which will ultimately have a positive impact on the services supported and delivered to citizens. Our LoRaWAN-based network has fostered innovation and accelerated IoT development. We are continuing to work to promote our LoRaWAN-based network to local innovators and startups looking to test their IoT solutions in the real-world. We’re aiming to spark creative ideas and make Calgary a more business and innovation friendly place to call home. We’ve shared our progressive and forward thinking IoT approach and provided advice to other municipalities, government organizations and industry partners across Canada as well as the rest of the world. We hope our project and business model will be an inspiration to other municipalities looking to deploy smart city networks of their own. Visit the City of Calgary online.